Pictures from the arrests showed an arsenal of weapons and ammunition seized during the captures. (CNN) -- The Mexican Federal Police captured eight people involved in a daylight shootout that paralyzed three sections of Ciudad Juarez, Mexico, Wednesday afternoon, authorities say. Among those arrested were five cartel members with ties to the Sinaloa cartel who admitted to being involved in the kidnapping of a groom and three others at a wedding in Juarez on May 7, Municipal Police spokesman Jacinto Seguro told CNN. The four victims from the wedding were found dead in the back of a pickup truck days later. Some have speculated that the groom, a U.S. citizen whose family owns a transporting company in New Mexico, had ties to the Juarez cartel. When the bodies of the victims were found, they showed signs of torture. The victims also had pig faces drawn on their foreheads, a symbol used by the Sinaloa cartel to describe their rivals from the Juarez cartel. Federal police said the other three of the eight people detained had ties to the Aztecas, a local gang of drug dealers in Juarez that acts as the enforcing arm for the Juarez cartel in the city. With them was a man from El Paso, Texas, who had been kidnapped and held for 15 days, Seguro said. The sequestered man, 54, identified only by his alias "El Pistolita" had ties to a cartel, Seguro said. The eight men were captured Wednesday in two separate events that took place between 2 p.m. and 3 p.m., Seguro said. Police identified the detained Sinaloa cartel hit men as Ricardo Esteban Rubalcaba Reyes, 24, alias "El Guawis"; Jose Alfredo Monreal Escajeda, 37, alias "El Primo"; Porfirio Rubio Valle, 48, alias "El Pilo"; Jesus Emilio Gil Acosta, 40, alias "El Milo"; and Cecilio Torres Adriano, 43, alias "El Cilo." Among the men detained with Aztecas/Juarez cartel connections were Tomas Antonio Duarte Amaya, 33, alias "El Tony"; and Jesus Alfredo Lopez Cruz, 30, alias "El Chuy," police said. A third member of the Juarez cartel, who was only identified by his first name "Jesus," is 17. Mexican law prohibits the release of the identity of minors. 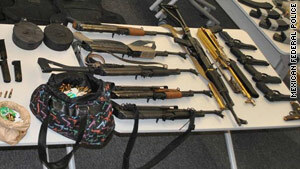 Pictures from arrests showed an arsenal of weapons and ammunition seized during the captures. The three from the Juarez cartel were detained while riding in a stolen green Ford Windstar which they used in a separate attack on a residence in Juarez, police said. Mexican federal police are calling the captures the most significant arrests since they took over security from the Mexican military one month ago.